It’s important to clean your gutters out at least twice a year, depending on where you live. In states that experience heavy rainfall or four distinct seasons, it is especially critical to keep the flow of water down the gutter clear of any blockage. Scheduling gutter cleaning in the late spring and early fall can help with that. 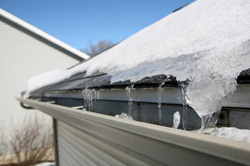 There are times you may have to clean your gutter out more, such as when you live in a climate with an icy winter. Working around the house may sound like a fun weekend project for some, but trying to clean out gutters yourself means you are taking a huge risk. Not cleaning them out properly can lead to disastrous results and expensive repairs later on. A professional knows the appropriate technique to clean out these channels to ensure your home remains free of damage. Your gutters aren’t something you should ignore. So if you are a homeowner faced with the prospect of gutter cleaning, consider hiring a professional to take a huge weight off your shoulders.